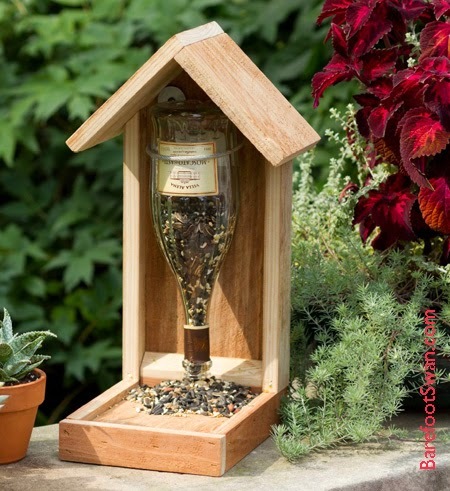 One of our hand made Wine Bottle Bird Feeders has been featured in the Dec/Jan 2014 issue of Birds & Blooms magazine. Magazine staff did a great job with the photography. We just received our copy of the magazine yesterday, but we've had a huge spike in orders for this feeder (and others) for over a week. Thank you Birds & Blooms magazine, for the wonderful pre-holiday promotion! 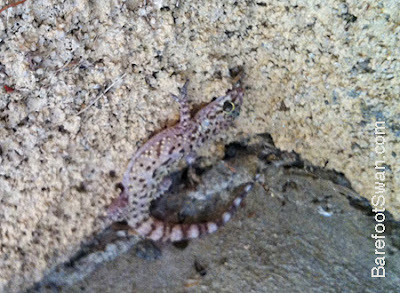 This little gecko spooked out from under the front door sill, when I went out to get the morning newspaper recently. At first I only saw the striped tail, and thought it was a desert native Banded Gecko. 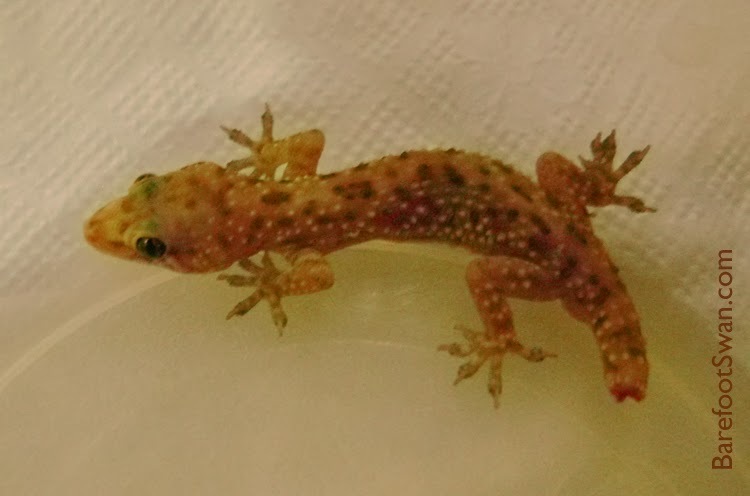 But then I noticed the bumps along its sides and recognized it as a Mediterranean Gecko, like the one we found in our house back in June 2012. That particular gecko had lost its tail during an encounter with one of our cats. I was curious to know if this was the same gecko, or if we perhaps had a population of these non-native geckos living in our yard. After enlarging, rotating and comparing the images side by side we really couldn't match up any of the markings. If this is the same gecko from last summer it has gained weight, grown back its lost tail, and changed its markings. If it's a different individual, then we may have a breeding population of Mediterranean Geckos living in our yard. 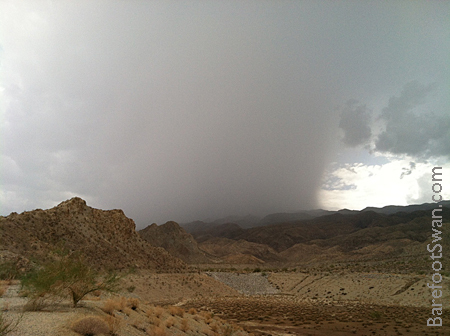 We had a rainstorm of near-Biblical proportions this afternoon. The skies opened up and dumped 2 inches of rain in our area, in just over an hour. 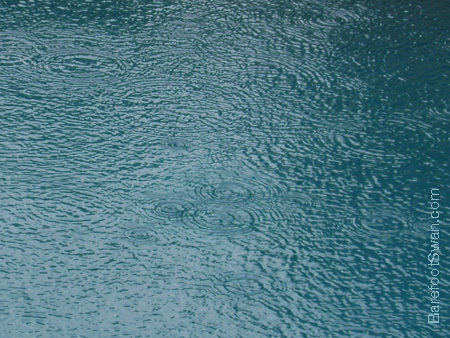 The water level in our pool came up over 3/4" in a half hour, during the heaviest part of the deluge. 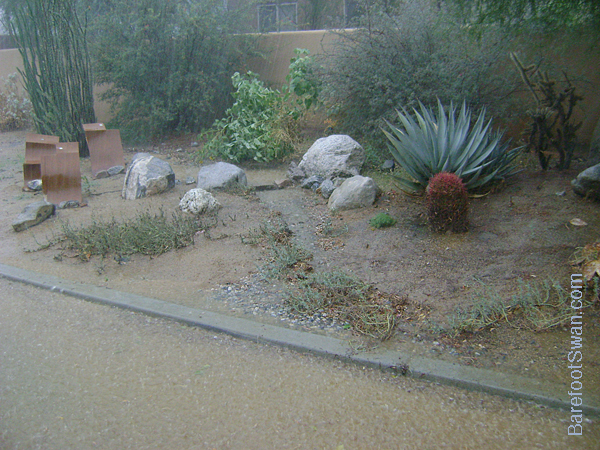 Our front landscaping includes a constructed wash, to quickly move water out of our enclosed courtyard. Normally the wash is just a decorative feature, but this afternoon it worked like a charm. 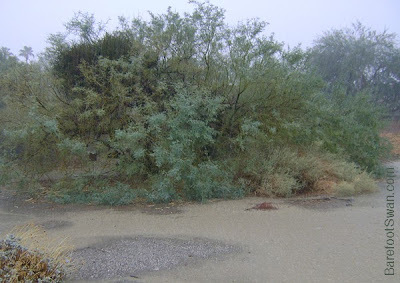 One of the neat things about rain in the desert, is how vibrant everything looks after a rainstorm. Probably just due to the desert dust being washed off of everything. 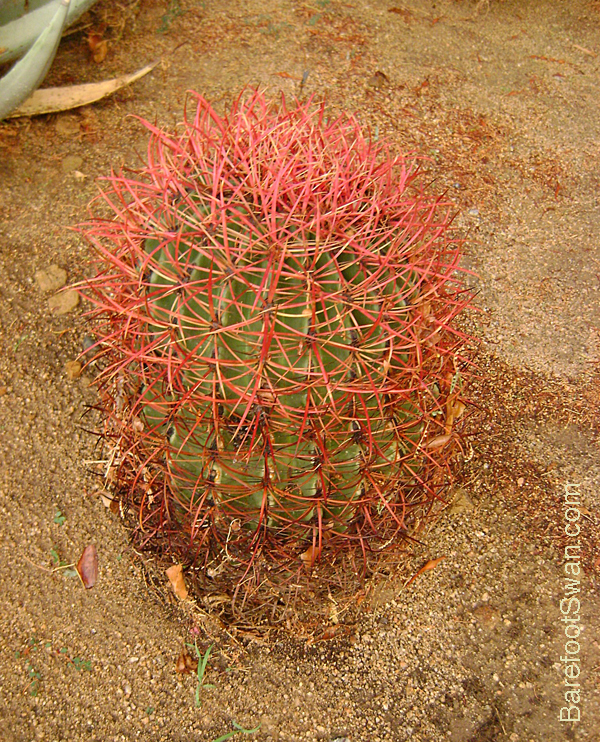 Our Red Barrel Cactus looked especially colorful after its bath. 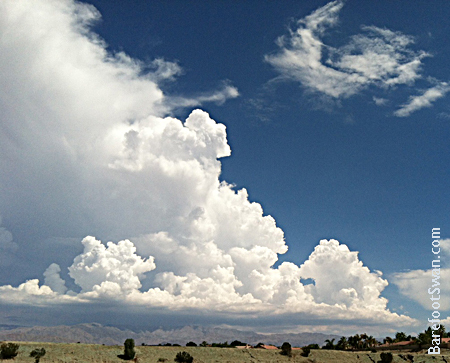 The rain eventually tapered off to a gentle sprinkle before finally moving off to the northeast. We were left with a gorgeous sunset. Come on with the rain, I've a smile on my face. Just singin', singin' in the rain." Went out to clean our swimming pool after a BIG dusty overnight windstorm, and found this little guy adrift and clinging to an inflatable raft in the middle of the pool. Not sure if he was blown into the pool, and managed to crawl up onto the raft? 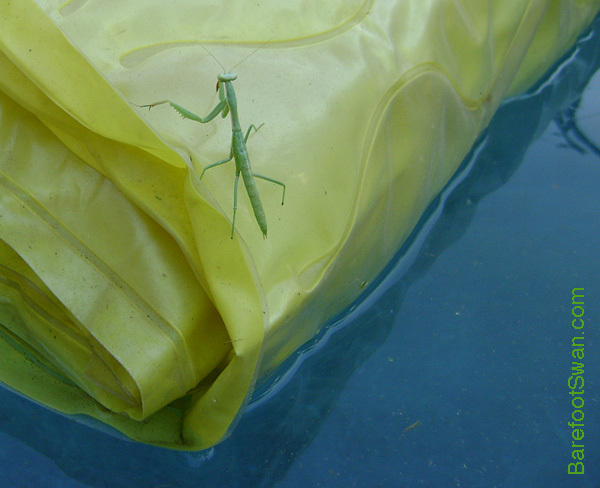 I carefully maneuvered the raft over to the edge of the pool, so I could move him to a safer location. As I put my hands out to pick him up, he looked right at me, reared up on his back legs and pulled his front legs tight against his upper body. 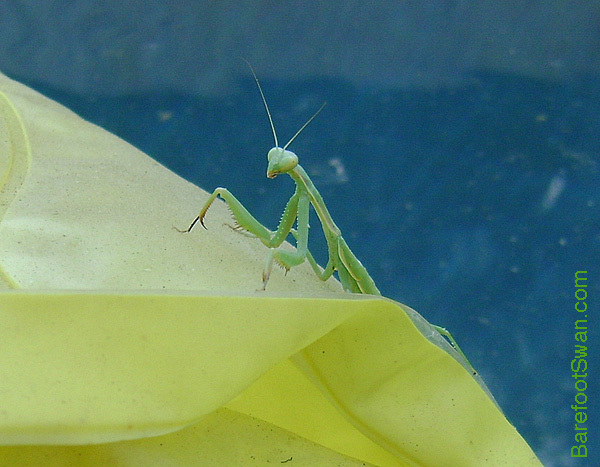 He eventually calmed down and stepped into my hand, so I could relocate him to our nearby flower garden. He'll be a lot happier there. Sail on, sail on sailor." 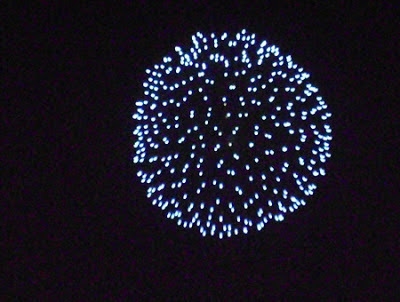 Tonight's full moon is a "Blue Moon". Spoiler alert: it's not really blue. Blue Moon on 20 August 2013. Most of us are familiar with the definition of a Blue Moon as being a second full moon that occurs during the course of a calendar month. Since the moon's phase cycle is 29.5 days, it's easy to see this doesn't happen very often - hence the saying "Once in a Blue Moon". 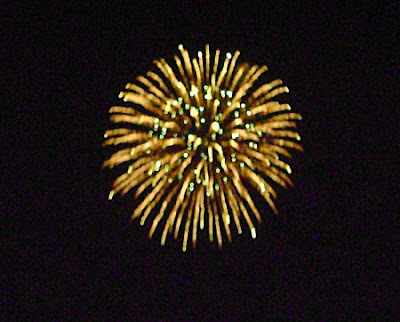 But there are actually 2 kinds of Blue Moon, and tonight's full moon is the second kind. 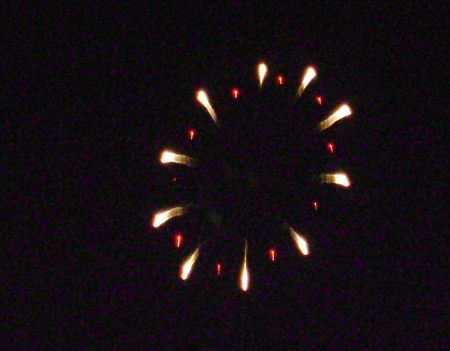 It's only August 20th, so this can't be the second full moon in August. Occasionally there are 13 full moons in a year. 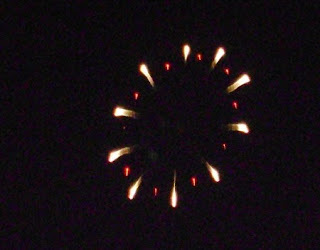 This means that one of the seasons (spring, summer, autumn, or winter) will have 4 full moons instead of 3. 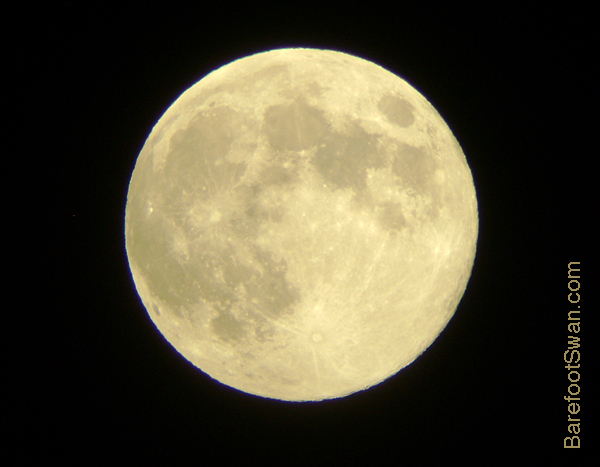 The full moon tonight is the 3rd of 4 full moons this summer. Since the 3 regular full moons have names (in this case: early-summer, mid-summer and late-summer) the odd 4th moon is called "Blue Moon" It is thought that the name Blue comes from the word belewe which means "betrayer". Photographers note: I took this pic of the moon by holding our point-and-shoot camera up to the eyepiece of our 25 power field scope. We were really surprised at the detail it picked up on the lunar surface. The rays of the crater Tycho show up amazingly well (lower center). The crater Copernicus is evident too (left of center at about 9:00), as well as the crater Kepler towards the left edge at about 3:30. 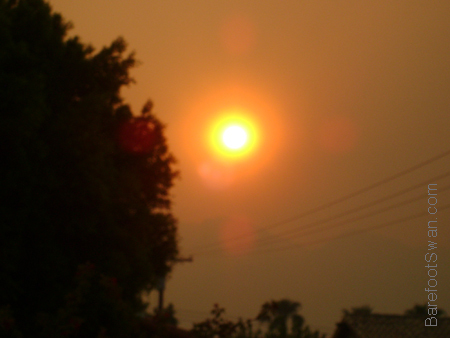 Without a dream in my heart, without a love of my own..."
Smoke from the Silver Fire, near Banning. 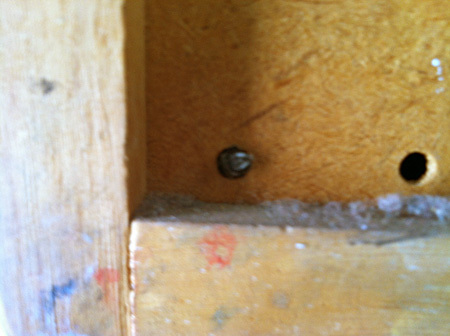 At work last week I noticed an insect flying in and out of the open door of the back shop area. 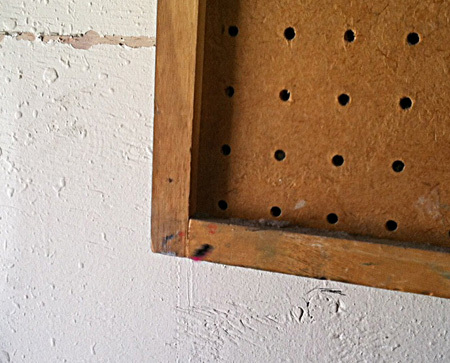 It hovered in front of the pegboard tool cabinet like it was looking for something. Then would fly out the door and return a few minutes later. I went over to see what was going on. 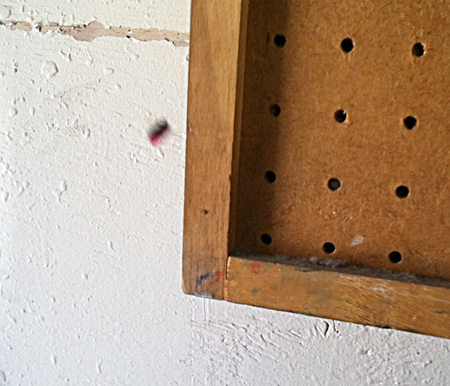 It turned out to be a little Leaf Cutter Bee, carefully inspecting the holes in the pegboard. The bee finally landed and crawled into one of the openings. After a few minutes she exited the hole and flew out the back door of the shop. I kept an eye on the Bee as it made a number of trips flying in and out of the shop. She was bringing bright pink circles cut from bougainvillea. This is a picture of her as she was backed into the hole, laying her egg (below). She continued working the whole morning, flying in and out of the back door bringing more bits of pink bougainvillea. She stopped her trips by early afternoon, and I didn't see her again after that. 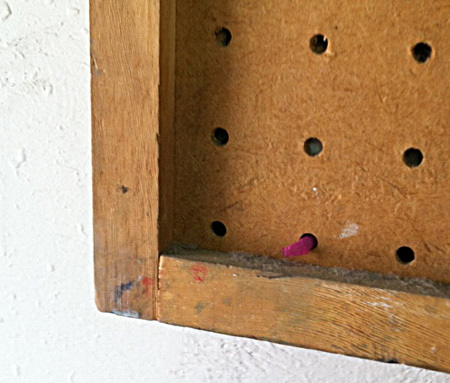 She left a bit of bougainvillea hanging out of one of the pegboard holes. When I left work that afternoon, I drove around the building looking for the bougainvillea plants she might have been using. The closest one was across the street and about half a block away. 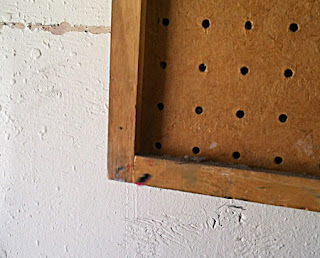 It was pretty odd to think that an INDOOR pegboard tool cabinet was the best option a Leaf Cutter Bee could find to lay her eggs in. She must have looked in a lot of different places to find suitable "habitat", and hopefully she did find other locations for her eggs. This was a clear example of how important man-made habitat can be to help the smallest creatures to survive - even if it is a happy coincidence. 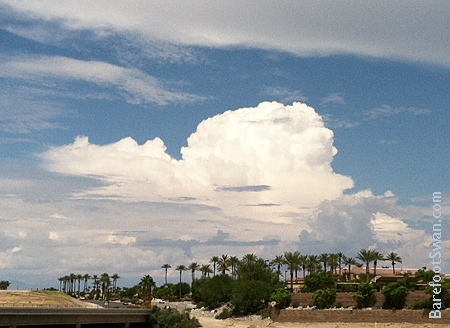 Our desert monsoon season has started a little earlier than usual this year. 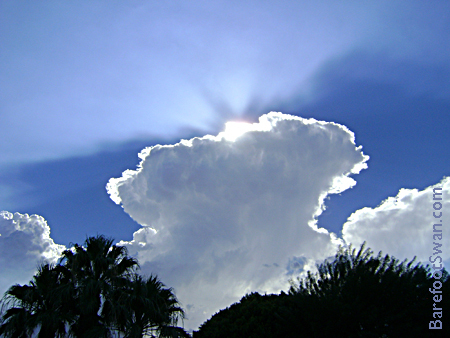 We've had clouds and high humidity the last 2 weekends. Yesterday we finally had some rain. 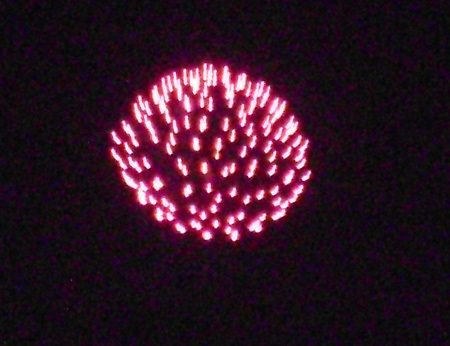 Actually, more like sprinkles in our area. 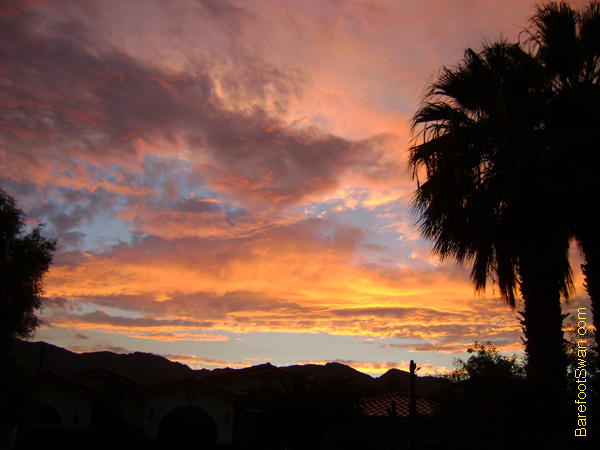 Palm Springs and the nearby mountains received more rain than we did. It helped to slow the Mountain Fire. 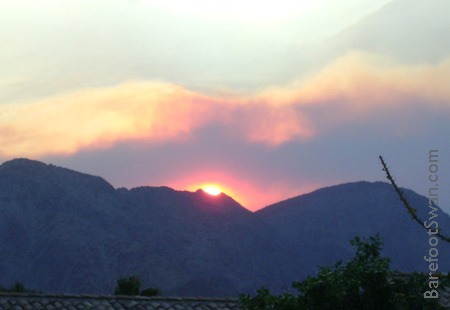 Colorful sunsets the last couple of evenings due to the Mountain Fire burning behind Mount San Jacinto, just west of Palm Springs. There is an area in our front yard that has been - well, challenging. We originally planted a small cactus there, but it was soon overrun by weeds and flowers that re-seeded from other areas of our yard. 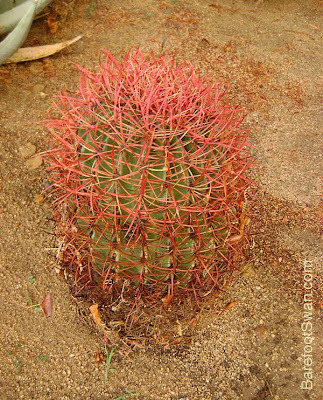 In spite of constant weeding and tweaking the drip irrigation, the cactus just wasn't happy there, and the weeds were winning. It's hard to even see the cactus in this picture (Clue: center bottom). 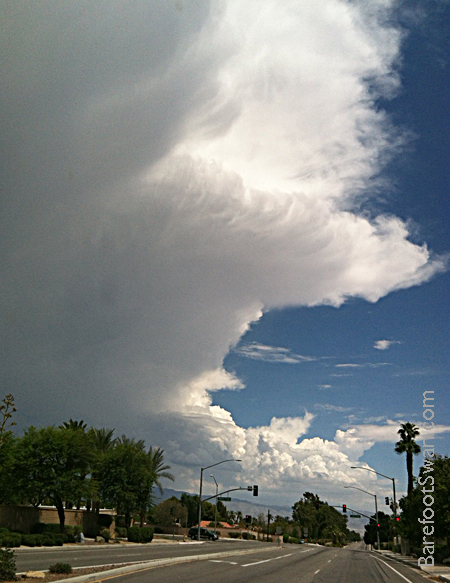 I decided to take advantage of the cloudy skies and relatively cooler temperatures (low 100's) we were having with the monsoon weather, to work in the yard and see what could be done to clean things up there. 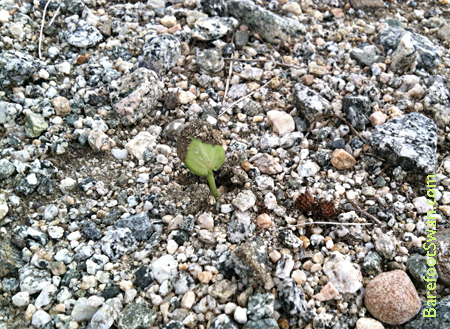 One of the volunteer plants growing in the clump is Salt Heliotrope. It had been growing there for a while and had spread into some nearby areas of our yard. 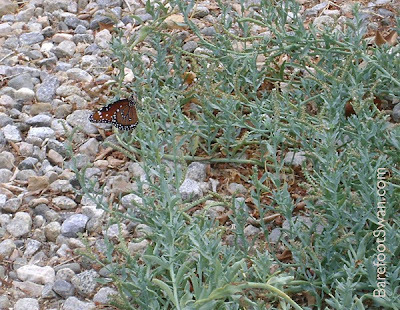 I had previously been pulling it as a weed until I noticed that butterflies really seemed to like it. So I decided to change my thinking, listen to Mother Nature and give it a chance. 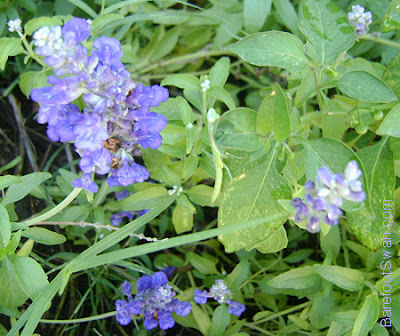 Salt Heliotrope is native to the western and southern U.S. and up onto the Great Plains. 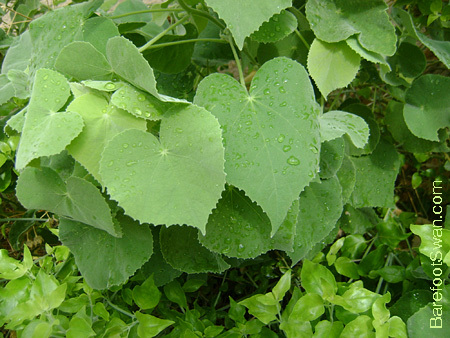 It has also naturalized in some parts of the northeast. 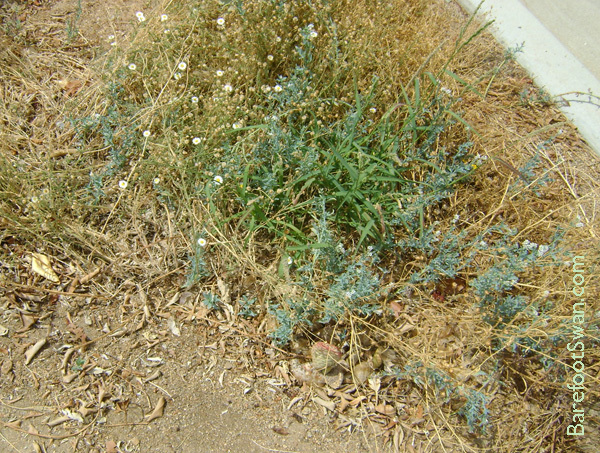 The plant has long stems that grow low to the ground. 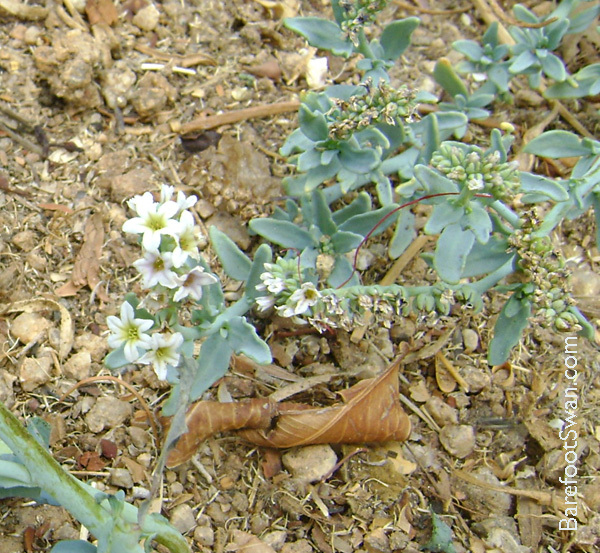 The white flowers are small and simple, but actually rather pretty - bell shaped with a yellow or purple center. 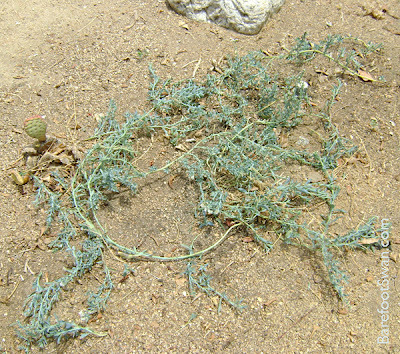 The fleshy leaves and stems are a greyish-green color. Salt Heliotrope can grow well in salty and alkali soils, as well as wetland areas. 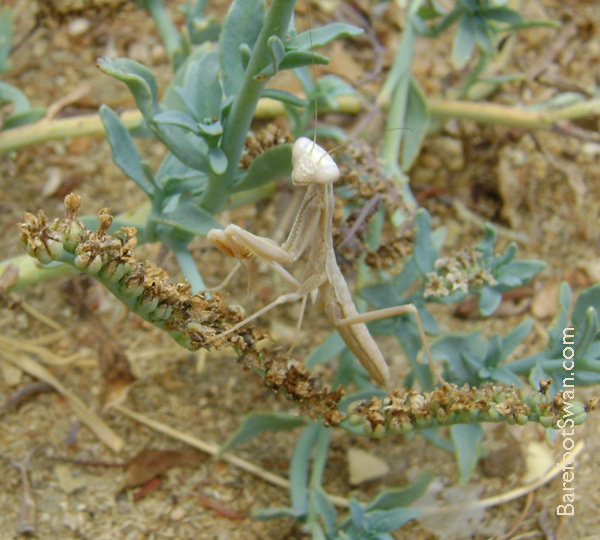 While I was working, I came across a number of Praying Mantises. This one watched me intently. I apologized for disturbing his neighborhood. 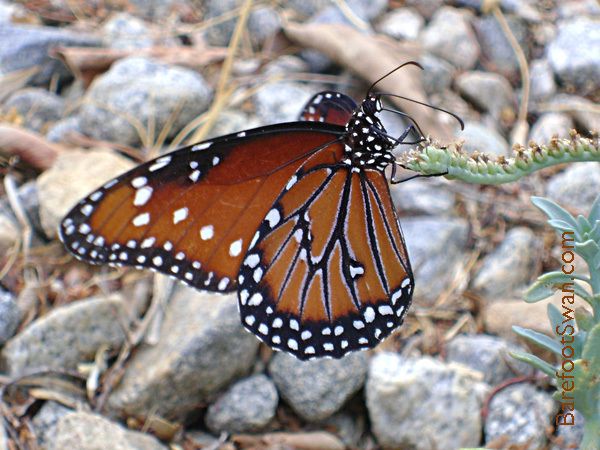 He ended up relocating to the nearby agave. It took awhile to untangle the long stems. After some selective weeding we were left with some scraggly looking stems of Salt Heliotrope. I rebuilt the irrigation ring, adjusted the drip head and called it a day. 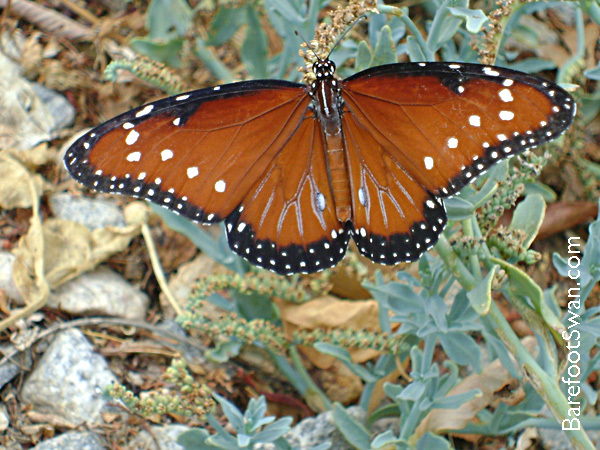 The next morning I went out to check on the plants, and there were 2 Queen Butterflies flitting between the patch I had weeded and another clump of Salt Heliotrope nearby. 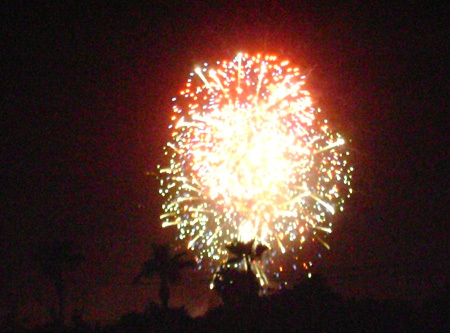 I grabbed the camera, and was able to get some nice shots. It really didn't take much effort to create a new bit of wildlife habitat. Our yard has been changed for the better. And it didn't cost a thing. can now read my name without glasses. And he can double the reward on my head!" "How little do my countrymen know what precious blessings they are in possession of, and which no other people on earth enjoy!" 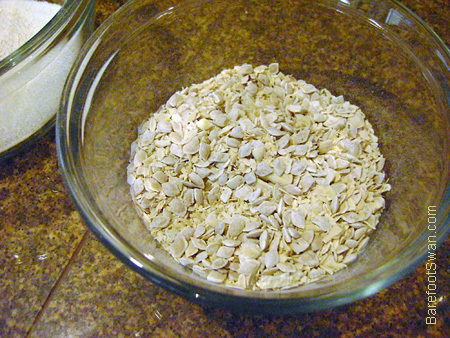 Mesquite flour can be substituted into regular recipes in small amounts. Because it is gluten-free, mesquite flour does not add the "stretchy" elastic qualities that other flours provide for leavened dough. 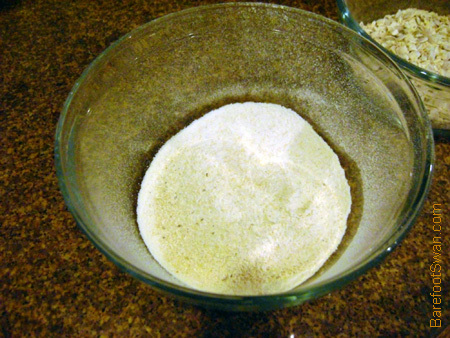 To avoid overly crumbly results, mesquite flour should be limited to no more than 20-30% of total flour in a recipe. Mesquite flour is also naturally sweet, so sugars or other sweetening ingredients may have to be adjusted to taste. This morning we made waffles with some of our mesquite flour. We adapted our normal from-scratch recipe and they turned out really tasty, with just a hint of the sweet mesquite flavor. As an added bonus, the kitchen smelled like sweet mesquite while these were cooking. Stir dry ingredients together in a bowl. Make a well in the center and add the egg, canola oil and water. Stir together until well blended. Let sit about 10 minutes to allow the baking powder to rise. 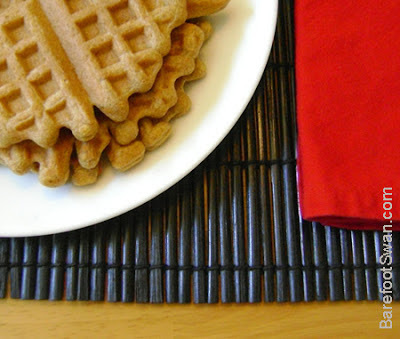 Bake on a pre-heated waffle iron until done. Makes about 5 medium-size waffles. "And I thought the waffle fairy was just a bedtime story!" One year ago today we took the first picture in this series, recording the north-to-south movement of the sun's path across the sky over the course of a year. 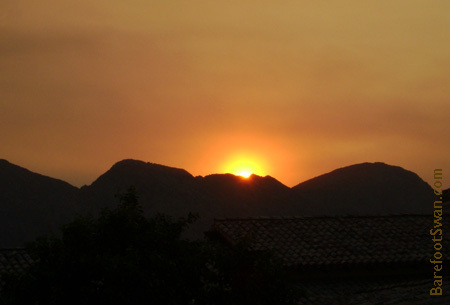 To show this movement, we took photos of the sun setting behind the mountains on our western horizon. Sun is furthest north and highest in the sky. Equal hours of daylight and dark. Mid point between Summer and Winter Solstices. Sun is furthest south and lowest in the sky. Equal hours of daylight and dark. 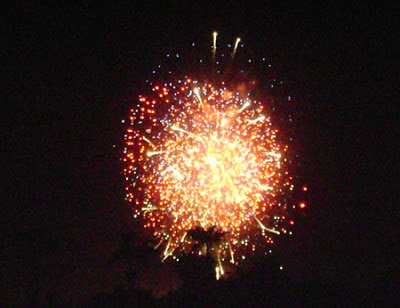 Mid point between Winter and Summer Solstices. 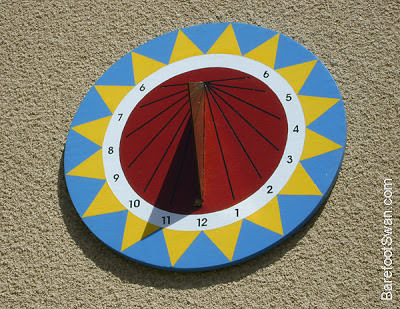 Long ago before there were watches, printed calendars and smart phones, our ancestors observed the movements of the sun and stars to keep track of time. 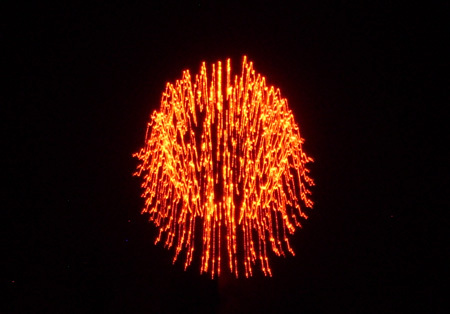 Human-built structures such as Stonehenge, Chaco Canyon, Central American pyramids and many other monuments worldwide helped skywatchers to mark the passage of time. They were able to schedule and prepare for annual events such as planting, harvesting, dry and rainy seasons and more through an understanding of the recurring celestial patterns. Our wall mounted sundial is a reminder of the times when people couldn't just check a smart phone to know the time of day. Although the traditional markers of time are no longer in common use, they still work - even if we don't take time to notice. Make the mighty ocean, and the pleasant land. 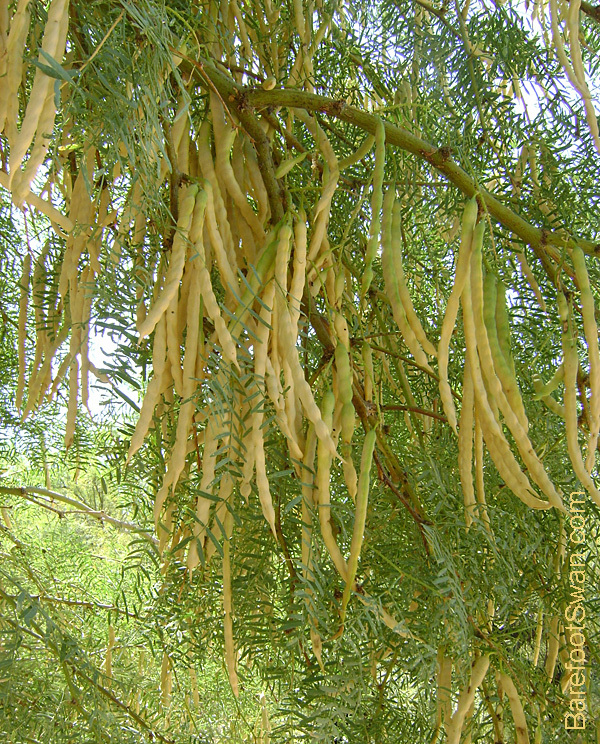 The pods on our mesquite trees have been ripening since the first week in June. 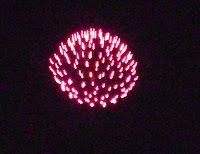 We usually expect to harvest each year around the 4th of July, so this is a couple of weeks earlier than normal. To harvest the pods, we spread a clean bed sheet below a tree branch and knock the branch with a broom handle. Only the ripe pods will fall off easily onto the sheet. You can shake the pods and hear the seeds rattling inside, another sign that the pod is ripe. We rinse the gathered pods to remove any dust, and then spread them on racks to let them dry thoroughly. The pods must be completely dry before grinding. We started out with 1 pound of mesquite pods. Any pods that were obviously discolored or inferior quality were sorted through and removed. One pound of pods was enough to fill a 2.5 quart bowl. 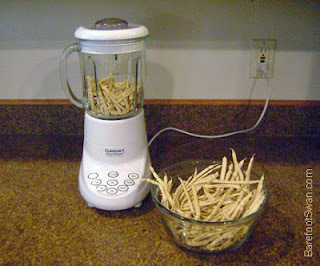 The selected pods were broken into smaller pieces and ground a small batch at a time in the blender. It seemed to process best with the blender about 1/3 full of broken pods. We ran each batch for 20-30 seconds, at the Puree setting. It is important to grind the pods when the weather is not humid. 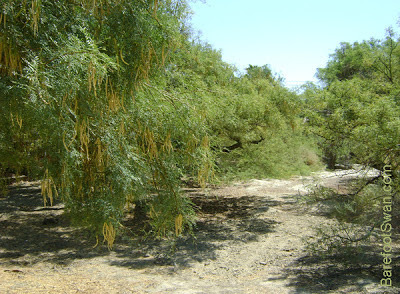 Otherwise, the mesquite flour can become sticky and difficult to process. 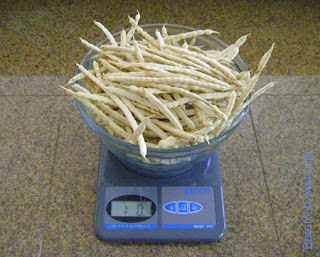 After processing the pods we have the mesquite flour, some rough chaff, and the seeds inside the pods. 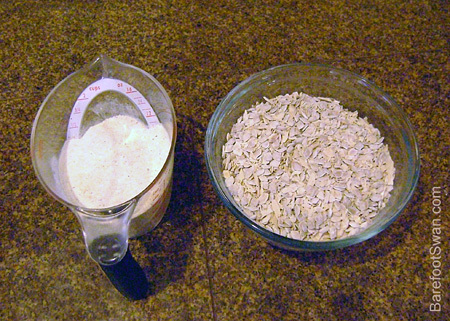 The flour is sifted after grinding, to separate out the seeds and chaff. Mesquite flour has a sweet and nutty taste. 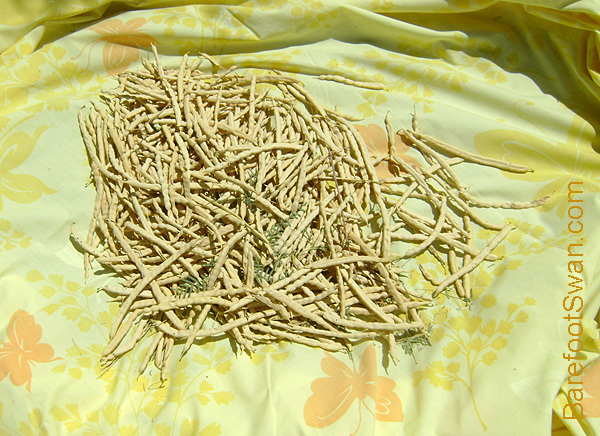 It is highly nutritious: high in dietary fiber and protein, low in carbs and fat, and has a low glycemic index. The coarse chaff can be used to make a mesquite sun tea. The seeds are high in protein, but are extremely hard. A hammermill would be needed to process the pods and seeds completely. Mesquite Flour is gluten free. 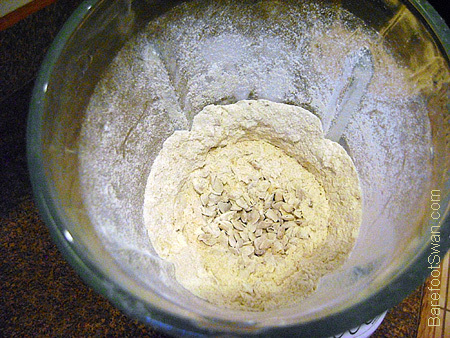 Substitute no more than 1/4 to 1/3 mesquite flour for the regular flour in your recipes. Mesquite Flour is naturally sweet, so you may wish to adjust the amount of sugar and other sweeteners in your recipe as well. There are lots of free recipes online for cooking with Mesquite Flour.